When we first published the Financial Secrecy Index many were amazed that the USA came top, and the UK high up the list. In 2011 that changed slightly as we extended the range of measures used to determine the issue, but the top 15 still looked like this. 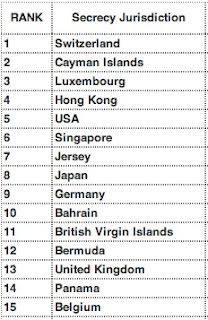 While some were surprised to see the USA, Germany, UK, Japan and Belgium revealed as secrecy jurisdictions, this table - created from objectively measured criteria - supported exactly what we have been saying for a very, very long time. Jason Sharman, an Australian academic TJN has known for some time, has now confirmed this. He and his co-authors Michael Findley and Daniel Nielson have a new report out today, where they impersonated a variety of would-be money launderers, corrupt officials, and terrorist financiers to requesting anonymous companies. 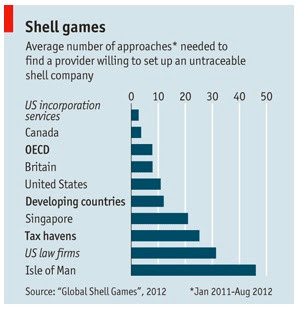 "SHELL companies—which exist on paper only, with no real employees or offices—have legitimate uses. But the untraceable shell also happens to be the vehicle of choice for money launderers, bribe givers and takers, sanctions busters, tax evaders and financiers of terrorism. The trail has gone cold in many a criminal probe because law enforcers were unable to pierce a shell’s corporate veil." The international standard governing shells, set by the inter-governmental Financial Action Task Force (FATF), is clear-cut. It says countries should take all necessary measures to prevent their misuse, such as ensuring that accurate information on the real (or “beneficial”) owner is available to “competent authorities”. More than 180 countries have pledged to follow it. A forthcoming study* scrutinises the level of compliance worldwide. The results are depressing. "This study, by far the most thorough of its kind, makes sobering reading for anyone who worries about the link between financial crime and corporate secrecy. OECD countries show little willingness to tackle their own weaknesses and end their hypocrisy. In America, by some measures the least compliant of all, the incorporation-friendly states and business groups opposing reform continue to have the upper hand, despite valiant attempts by Senator Carl Levin to push through legislation that would require the registration of beneficial owners. Movers of dirty money know where the best shells are to be had, and it is not on a Caribbean island." It is important to note that this tests just one issue: that is all. It is an important issue, to be sure, but our Financial Secrecy Index considers 15 secrecy indicators, which cover a far broader range of issues. But let’s not deny that this unearths an important point that many people have ignored and that we have been saying for years: this problem begins in rich, developed countries: not small islands. "The overwhelming policy consensus, strongly articulated in G20 communiqués and by many NGOs, is that tax havens provide strict secrecy and lax regulation, especially when it comes to shell companies. This consensus is wrong." The way this section is written suggests that by 'tax havens' the report's authors mean small jurisdictions. As our long years of work (and this blog) make clear, we don't think that small jurisdictions are the heart of the problem, much that we like to criticise the relevant ones (and much that they deserve it). In fact, we argue that the world's previous obsession with small islands in this context has served to distract from the real problem, which is big countries - most importantly the United Kingdom, which runs its own 'spider's web' of satellite tax havens around the world. Despite minor differences in the way tax havens are defined, we welcome this new report. Bring it on, may it get the coverage it deserves, and may the world's journalists and citizens continue to wake up to the gigantic threat it poses to the lives of the 99.9 percent of the world's population who aren't rich enough to be able to afford to send their money offshore and escape the rules of civilised society.